Dubai International Financial Centre (DIFC), the leading financial hub for the US$7.8 trillion Middle East, Africa and South Asia (MEASA) region, today announced the successful results of its first half 2016 operating review. DIFC continually ranks highly in different international rankings and earlier this year was ranked number one in the Middle East and Africa region and number 13 globally in the Global Financial Centres Index (GFCI). This is a significant increase from last year in this ranking which looks at the competitiveness of financial centres based on 25,650 financial centre assessments. This has resulted in DIFC becoming the financial services hub of choice for the entire region. Testament to its world-class connectivity, as well as its regulatory and legal systems, significant growth and milestones have been reached on the journey towards its 2024 strategy, which will see the Centre triple in size over the course of 10 years. DIFC reached another milestone of crossing over 1,500 firms, with 1,539 companies now based in the Centre. 143 new companies joined DIFC in the first half of the year alone, representing a 16% growth on this time last year. Newly registered firms included companies taking the highest category licenses, such as HSBC, which announced moving its Middle East Headquarters and US$40 billion of assets to the Centre. 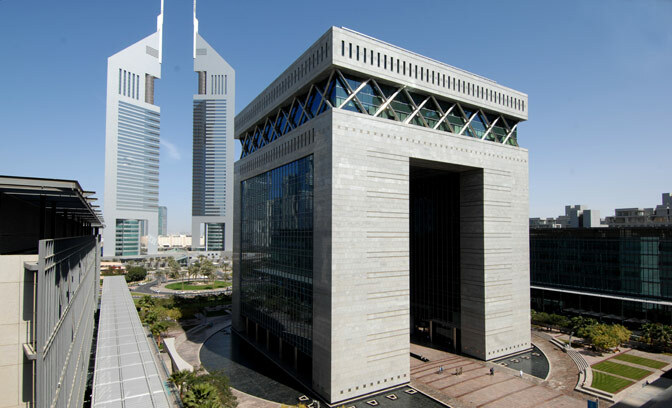 The first six months also saw reputable regional banks join the DIFC, including Ahli United Bank Limited – the first GCC bank to receive a Category 1 (full branch) license – and Bank of Palestine, which set up its first overseas operation. In other key sectors, the Centre welcomed its first Indian reinsurance firm, HDFC International Life and Re Company Limited, to its portfolio, along with leading Kuwaiti asset management firm, KAMCO Investment Company Limited, which established its first international office in DIFC. The 1,539 active firms in the Centre are now made up of a record 425 financial services firms (an increase of 11% on this time last year), 914 non-financial firms (a 22% increase on this time last year) and 192 retailers (2% increase on this time last year), taking a further 81,300 square feet of leased space. Occupancy rates remain extremely high representing the ongoing demand for DIFC space and in retail, the new Gate Avenue at DIFC project will significantly increase the size of the Centre’s retail portfolio. These global firms come from around the world with 33% from the Middle East region, 18% from the EU, 15% from the UK, 12% from the US, 12% from Asia and a further 10% from elsewhere in the world. DIFC surpassed 21,000 employees working in the Centre’s firms, an important landmark as the Centre looks to target 50,000 employees by 2024, meaning 42% of the target has been met. 21,076 employees, an increase of 14% or over 2,500 new professionals, from this time last year, now work in the Centre. The DIFC’s highly skilled, specialist and internationally orientated employees are crucial to the future success of not just the Centre but the competiveness of Dubai itself on the international stage. These employees come from major hubs and markets around the world, working in the highest value sectors, further contributing to the expertise in financial services in Dubai and across the region. DIFC has continued to build on its world-class infrastructure to ensure that the Centre remains the optimal place to do business. Major initiatives have included the launch of Gate Avenue at DIFC, a retail development which will link up all the Centre’s areas through 660,000 square feet of premium retail space hosting over 150 exclusive dining, shopping and leisure attractions. This will enhance the connectivity of the Centre and increase its attractiveness as a place to live, work and visit. Set for completion at the end of 2017, the project represents the Centre becoming a premium lifestyle destination and a new concept of urban development in the region. The infrastructure was further developed by the addition of a number of real estate offerings. The joint venture between Investment Corporation of Dubai (ICD) and Brookfield Property Partners broke ground on its US$1billion development in DIFC in January. The 282 metre-high, 54-storey ICD Brookfield Place tower will contain more than 900,000 square feet of Grade A office space and connect to a 150,000 square feet, 5-storey retail centre. In March, luxury hotel chain Four Seasons opened its second property in Dubai, an eight-storey hotel located in DIFC’s Gate Village, featuring 106 rooms and suites. In addition, strong construction progress has been made on Gate Village Building 11. Across a total built-up area of 200,000 square feet, the premises will offer 160,000 square feet (82%) of office space and nearly 40,000 square feet (18%) for retail and F&B outlets. Further recognition was given to DIFC’s innovative, co-located Data Centre, which gives clients real-time, secure access to markets, by becoming the first data centre in the UAE to receive the internationally recognised Management & Operations Stamp of Approval from the Uptime Institute. This is an important endorsement of the Centre’s cutting edge technologies and ability to meet client servicing needs, which are increasingly built around data. At the same time, DIFC signed an important agreement with DEWA’s Etihad ESCO, to replace nearly 30,000 LED lightbulbs in order to drive 72% energy savings over the next six years. The agreement makes DIFC the first free zone and financial hub in the region to comprehensively commit to such an ambitious energy saving scheme and is testament to the Centre’s commitment to sustainable development across its integrated ecosystem. In line with the Centre’s 2024 strategy, focused on facilitating business transactions, trade and investments across the South-South corridor, DIFC leadership undertook a number of highly successful roadshows to international markets, such as China, India, Singapore as well as London and Luxembourg. To support the One Belt, One Road initiative, multiple visits took place to China, including around the 2016 G20 Conferences where DIFC met with prominent banks, capital markets platforms, securities and non-financial firms to build on the strong Chinese presence in DIFC, which has seen banks double their balance sheets since the end of last year. Further conversations at the BOAO Forum for Asia focused on DIFC’s support for the One Belt One Road initiative which is linking up the MEASA region and how DIFC can continue to be a key entry point to investment in this region. In May, DIFC took part in City Week London 2016 where representatives shared views on global economic trends, asset management, fintech and emerging economies. DIFC also took the opportunity to showcase the Centre’s global leadership position and distinct proposition in line with the 2024 strategy. A delegation from DIFC also participated in the UAE-Luxembourg Council for Cooperation and Development of Islamic Banking and Finance. Discussions centred on strengthening DIFC’s long-standing partnership with Luxembourg and exploring the future of Islamic Finance, including the impact of fintech. In addition, DIFC now has over 90 MOUs in place with jurisdictions in the region and around the world, including the recently signed strategic partnership agreement between DIFC and Dubai Economic Council (DEC), which mandates the two entities to share best practices in the areas of financial studies, economics, research and corporate governance. Further efforts are continually underway to expand on this already comprehensive framework of agreements, increasing the ease of doing business in the Centre. DIFC’s commitment to creating an integrated technology platform, with supporting policies and regulations for fintech, was reflected in further efforts the Centre made this year. In particular, as part of the DIFC’s membership of the Global Blockchain Council the Centre is working towards creation of “proof of concept” for registering wills on the Blockchain. This project will enable DIFC Courts in providing their services under the tenets of transparency and efficiency. DIFC also further strengthened the client experience for tenants and partners with the development of an interactive website and a new properties listing website which makes it easier to compare and access available real estate within the Centre. There was also the development of a new client app to make it easy to access information, undertake transactions, collaborate and share information in a more accessible way. Employee health and wellbeing featured highly with DIFC named official partners of the Bloomberg Square Mile Relay, which saw over 50 corporate teams race around the district for charity as part of an international series across major global financial centres. Employees also undertook diabetes and blood glucose level checks, participated in International Health Day, which this year focused on the pressing issue of diabetes in the region, donated to blood banks and undertook free eye check-ups within the Centre for the Noor Dubai Foundation. Additionally, employees and staff held a series of charitable and health events, such as donating equipment to the Rashid Center for the Disabled, an iftar donation of books to kids suffering from thalassemia, in line with the Year of Reading and as part of DIFC’s ongoing support for the Thalassemia Center in Latifa Hospital. There has also been continued collaboration with the Al Noor School for people and children with disabilities and the activation of its work in the Centre. Furthermore, DIFC did its bit for the environment with a tree planting day at the Centre to improve air quality and the surrounding environment, employees taking part in a car free day by walking and using public transport, campaigns to raise the importance of recycling, the annual beach cleanup and observing Earth Hour. The rest of 2016 and the next year will remain focused on DIFC’s growth strategy and leverage the momentum of the previous first half. This includes continuing to build up the Centre’s client base, developing new synergies and growth in its target sectors. One area of active development is fintech, where the DIFC will support, encourage and foster greater innovation in the Centre. The DIFC will also explore opportunities to forge new links further across the South-South corridor and the MEASA region, which is anticipated to be worth some US$10 trillion by 2020. As ever, further investment will be made to enhance the Centre’s physical and regulatory architecture in line with its 2024 strategy.